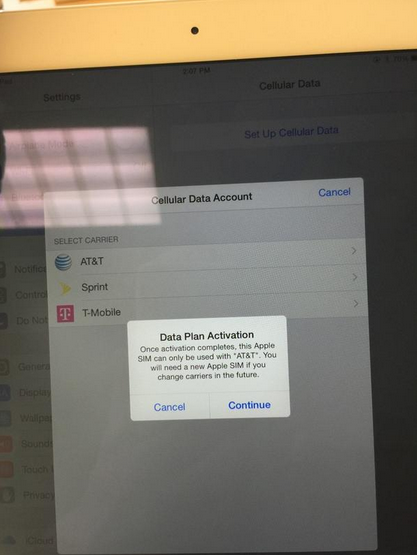 The idea behind the Apple SIM that comes in the new iPads is most excellent: one SIM, many carriers. Whenever you want to switch carriers, you’d just pop into settings and pick the new one. If you want to bring your own SIM, you can — but otherwise, everything happens through software. No swapping SIMs, no ordering new SIMs, no hassle. Alas, someone had to go and throw a wrench in the gears. AT&T (who else?) is mucking up the whole thing. With three of those four compatible carriers, you’re free to stretch your legs, hop between the offerings, and find the carrier that fits your needs. I’ve received confirmation from AT&T that they’re doing this, though I’ve requested further clarification as to why they’re doing it. No response there yet. Now, this only really applies if you’re buying a new iPad with an Apple SIM installed out of the box — which, confusingly, isn’t all new iPads. It depends on where you purchase the device. Buy it through Apple, it’ll have an Apple SIM. Buy it through an independent reseller, Apple SIM. Buy it directly through Sprint, for example, and it’ll come with a Sprint-only SIM. But when you get an Apple SIM, you expect it to work a certain way — and for it to continue working that way. AT&T — or anyone else, moving forward — doing this to an Apple SIM post-purchase is really just screwing up the whole idea. If this is its way of resisting the wave of change heading in its direction, then it’s just going to look like a jerk in the long run.